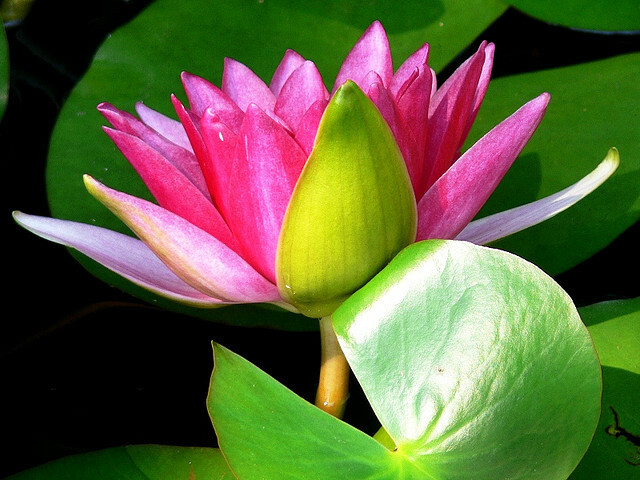 One of the interesting things about this lotus is that it was photographed in New Jersey. Day five, Friday, was a day for experimental standing poses. In this case, what happens if you create a shoulder brace out of a long strap, hold the ends of the strap, and do your standing poses without taking weight into your hands? One thing is certain: you find out how much you are using your arms to support your poses. That isn’t to say that the arms don’t have work in the standing poses. But their work to open the chest and shoulders, not to hold the body weight for the legs. Saturday’s practice is shoulder stand variations and forward bends. What’s different from Tuesday and Thursday? On Saturday there are no abdominal poses – although we’ll be conscious of our core in every pose. Saturday is also the one day of the week when we work the Padmasana (lotus pose) variations. Geeta Iyengar’s intermediate practice from A Gem For Women, which is the main outline for our Sadhana, suggests both the full pose and Yoga Mudrasana – legs in full Padmasana, hands crossed behind the back, holding the feet. First we’ll work on opening the hips in firelog pose, stacking the shins on top of each other. If all is well, we’ll proceed to Ardha Baddha Paschimottanasana (half bound lotus pose) and perhaps to the full pose. Since the Padmasana cycle shows up only once a week, it can be a handy measure for progress. Given all of the other poses and their hip-opening actions, how much does your external rotation improve when you try Padmasana?